Since being founded in April 2011, HoneyLove has been leading the grassroots effort to legalize urban beekeeping in Los Angeles, beginning with an extensive feasibility study and outreach campaign in Mar Vista. From there we gained the additional support of 10 Neighborhood Councils throughout Los Angeles: Del Rey, Greater Griffith Park, South Robertson, Silver Lake, Hollywood United, Atwater Village, West LA, Boyle … Read More Since being founded in April 2011, HoneyLove has been leading the grassroots effort to legalize urban beekeeping in Los Angeles, beginning with an extensive feasibility study and outreach campaign in Mar Vista. From there we gained the additional support of 10 Neighborhood Councils throughout Los Angeles: Del Rey, Greater Griffith Park, South Robertson, Silver Lake, Hollywood United, Atwater Village, West LA, Boyle Heights, Lake Balboa, and Chatsworth. Our thorough campaign work resulted in Councilman Bill Rosendahl putting our motion before the Los Angeles City Council where it is currently being studied by the Planning and Land Use Committee. And while we can't say that we have achieved full legalization yet, in creating the community model and approaching it from a grassroots level we've created momentum which cannot be stopped. Our most important achievements are not measured in legislative changes but in the number of people we reach, teach, and impact. In that respect we have been enormously successful. In a short time we've connected with people all over the world through monthly workshops, mentoring sessions, honey bee rescues, education outreach, neighborhood council involvement and social media connections. 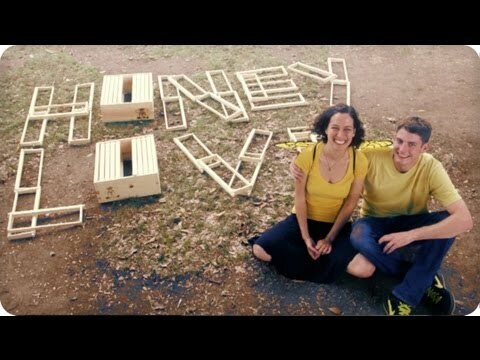 Our proudest single achievement is creating a global community of conscientious, active urban beekeepers who now share HoneyLove's mission with an ever-growing audience. In 2050, we hope to look back on our work and be proud to say that we helped lead the change toward a pesticide-free Los Angeles.